More in the way of public service; I notice that previous posts on the Ad Melkert/UNDP saga have drawn some traffic; so here's this: The Dutch daily paper NRC Handelsblad has an interview with Kemal Dervis today, defending Melkert. (oversimplified synopsis of the story so far for those who don't want to read in: some conservatives in Washington think Melkert should leave the UNDP because of the "Cash for Kim" scandal, and some liberals think that's only because the conservatives blame Melkert for the downfall of Paul Wolfowitz at the World Bank). "Mr. Melkert has my support as colleague and as his boss. Last week I spoke with authorities in Germany, France and Britain, and they all support Mr. Melkert. Why is this so personal? It could be because of matters in his political past in the Netherlands, there could be matters dating from his time at the World Bank. You know, I was a politician, he was too. In politics, people make enemies." 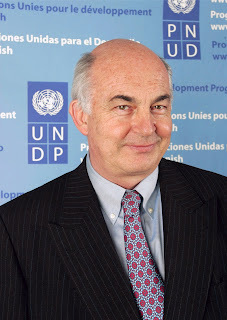 On the question of why the UNDP wasn't agreeing to a U.N. ethics investigation into the whistleblower question, despite requests from the U.N. secretary general, Dervis said there is an investigation into the scandal, and on the whistleblower UNDP is following its own rules (which are not the same as those of the U.N.; he hopes to harmonize with U.N. rules in the future). One other quote: "Despite all the commotion, outcry, there is not one piece of evidence of any personal fraud." Labels: dervis, melkert, politics, u.n.
Dervis and Melkert are two white-collar-criminals whom run a mafia-like organization involved in major corrupt deals from Asia to Africa, to Latin America and Central Kaukasian. The only way to stop them is introducing internal control mechanisms and helding the UN and UNDP accountable for every tax-payrs money they spent/ding. The world donors should have only one policy with the UNDP from now on: - NO ACCESS TO YOUR BOOKS- NO MONEY !! !